The roll-call of mankind's wars down the centuries is paralleled by an equally extensive catalogue of the theft, destruction, plundering, displacement and concealing of some of the greatest works of art. From the many wars of Classical Antiquity, through the military turning points and detours of the Fourth Crusade, the Thirty Years' War, Revolutionary and Napoleonic France, World Wars I and II, and then onwards to the ongoing contemporary conflicts in Afghanistan, Iraq, Syria and Libya, the history of art crime in times of war contains myriad fascinating and often little-known stories of the fate of humankind's greatest works of art. 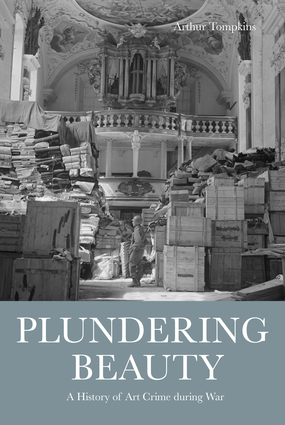 Plundering Beauty: A History of Art Crime During War charts the crucial milestones of art crimes spanning two thousand years. The works of art involved have fascinating stories to tell, as civilization moves from a simple and brutal 'winner takes it all' attitude to the spoils of war, to contemporary understanding, and commitment to, the idea that a society's artistic heritage truly belongs to all humankind. Judge Arthur Tompkins is a District Court Judge based in Wellington, New Zealand. He teaches the 'Art in War' component course at the Association for Research into Crimes against Art (ARCA) annual Postgraduate Certificate Program in Art Crime and Cultural Heritage Protection, based in Umbria, Italy, and was the editor of Art Crime and Its Prevention (Lund Humphries, 2016).